Google – on Monday – announced several updates to the Google Classroom product. The most exciting update is a new lock mode in Chromebooks allowing teachers to lock the screen of the students’ Chromebooks during quizzes. In the Google Classroom product, teachers can now also organize the assignment on the Classwork Page ensuring better connection with students, parents or guardians along with fellow teachers. Another new feature would enable parents to have more control over the school issued devices. Dubbed as “off hours,” the feature works more like a parental control functionality available on various devices such as the Fire tablet or Kindle, restricting the kids from accessing certain apps and content. Google also made updates to the digital education services for students, such as new Applied Digital skills training for both middle and high school students. Google is also looking to refine “Stream,” an old functionality that includes assignments, questions and other activities in Chronological order. Educators believe that scrolling through the content takes too much time as more posts are added. To address the issue, Google is introducing a new classwork section that would streamline the content by modules and units. This would help teachers to set the curriculum for the students as per semester and unit. Students, on the other hand, would be able to find and pick the assignment faster. Also, Stream would have a more compact view for assignments that would focus on questions and discussions. According to the search giant, the updates would help teachers and students find a common platform for conversations, wherein the teachers can inform about deadlines, post announcements and more. Students would also be able to comment on posts, and create a virtual forum in Classroom. Google is also adding a new “People” page. The page along with the changes to the settings would help bring classroom management together on a single platform. Teachers can utilize the section to manage students, guardians and teachers all in one place. Another new feature is Teacher Center, which would connect educators to the library of training materials, certifications, resources and communities. A new curriculum would also be added in line with the ISTE and CSTA standards in teaching computer science. The free tool for the students from fourth to eighth grades will help teach them irrespective of the teachers’ experience with the topic. The feature would be ready to use by the start of the next session. Along with software updates, Google also announced new hardware as well. The search giant announced the launch of the Acer Chromebook Tab 10 and the Staedtler Noris stylus. The new stylus would resemble the traditional pencil and support the suite of apps meant for the educators. Further, the company would also introduce its digital whiteboard, Jamboard in the education sector. The digital whiteboard will get new pricing and come with a free app that would allow interactivity across any touch convertible Chromebooks, simply through a free Android companion app. Google Chromebooks are quite popular among teachers and students with over 25 million of them using it across the globe. 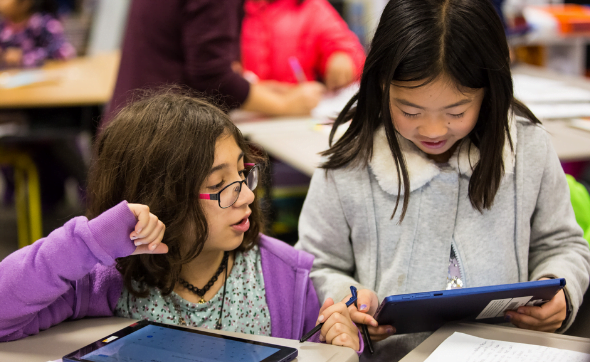 Further, over half of all primary and secondary students in the U.S. use Google education apps. Google Classroom was launched in August 2014 to help teachers with a common platform, wherein they can assign tasks and assignments to the students. Just last summer, Google introduced a host of new features and crossed the 1 billion assignments submitted milestone. Previously, Google also introduced the Classroom Chrome extension, which allowed the students and teachers to surf the web together. Google is moving its education-related efforts beyond Google Classroom with the company announcing Expeditions AR tours for anyone with an Android or iOS device via the Google Expeditions app. Further, the company has also stacked more content for the users to explore along with new features. Google Expeditions – launched in 2016 – allows teachers to take students on VR field trips with the help of the Google Cardboard Virtual Reality viewer. While using the cardboard in sync with the app, teachers act as “guides” controlling the VR experience for the students in the classroom, given they work on the same Wi-Fi network. Last year, during Google I/O, the company rolled out its AR Pioneer Program giving students an ability to use augmented reality in the classroom. The students could learn any subject by placing 3D objects in their classrooms with the help of a smartphone. Now, Google is extending the feature beyond Classroom, and making it available for everyone to download. For the iPhones running on iOS 11, the app would deploy ARKit – Apple’s augmented reality platform launched just last year. The Android devices would use ARCore 1.0.